Yvonne Navarro has worked as a waitress, a nurse’s aide, a bookkeeper and gift shop cashier, an accounting clerk, and a secretary. She started writing in 1982 and Her first two novels, AfterAge and Deadrush were finalists for the Bram Stoker Award. She writes SF and horror and media tie-in novels, including several Buffy the Vampire Slayer novels, Hellboy, Elektra, and Ultraviolet. You can find a lot of free excerpts at Yvonne Navarro’s website. 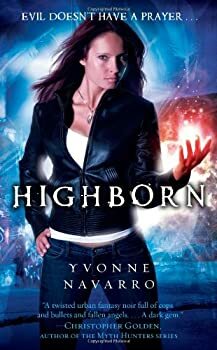 CLICK HERE FOR MORE SFF BY YVONNE NAVARRO. Highborn begins with a vividly described scene of Hell. Astarte, a fallen angel, watches the daily round of horrors from her bloodstained tower, and decides she wants out. We then cut to Astarte, having escaped Hell and calling herself Brynna Malak, as she adjusts to life in modern-day Chicago. Brynna can understand any language she hears. She’s less adept at navigating other aspects of human life: how to feel empathy, how to pet a dog, and why you shouldn’t just wander away from the scene when you witness a murder. Yvonne Navarro does a terrific (and often funny) job of portraying a character who just doesn’t “get” social norms and has a lot of acclimating to do. 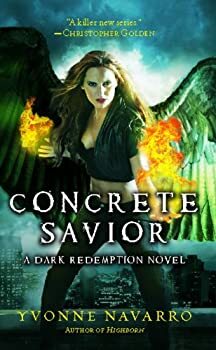 Concrete Savior is the second in Yvonne Navarro’s Dark Redemption series starring Brynna Malak, a fallen angel living as a human in Chicago and trying to earn her way back to Heaven. I enjoyed the first book, Highborn, and Concrete Savior is just as good. Like its predecessor, it mixes angel/demon mythology with superhero tropes for a unique urban fantasy blend.